Dating a ring? Possible Art Nouveau Ring? So I came across a band of forget me nots that I really like. According to the seller, it is from the Art Nouveau period (1890-1910). I think that seems right but I don't know. It is a piece of estate jewelry and is marked "Sterling - Orlando" on the inside. Well, it is difficult to say whether or not the ring could be from the Art Nouveau period, because it does not have any defining characteristics or hallmark stamps from that time. 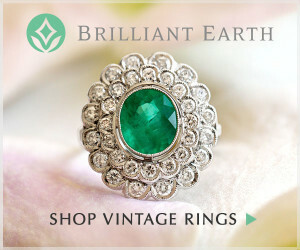 I would like to know why the seller of the ring believes that it is from the Art Nouveau period. 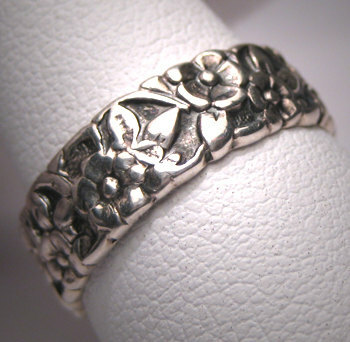 While flower motifs and sterling silver were both widely used to create Art Nouveau rings – flower motifs on sterling silver bands have been popular throughout the last 150 or more years. Really, this ring could have been made a few weeks ago – or a hundred years ago. However, what concerns me is that the seller is selling the ring as an Art Nouveau ring without any defining reason why it is believed that the ring is from the Art Nouveau period. 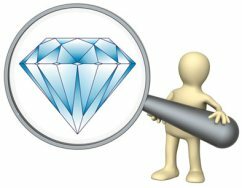 Antique and vintage rings that are not stamped, can often be identified and dated according to unique style features, gemstone or diamond cuts, the condition of the metal (for example, handrolled vs. machine alloys) and the karat of the metal. Often, many of these features combined help to date a ring. But this ring does not seem to have any defining features at all. I did a little research on this ring in particular, and found the exact same ring up for sale on 3 different websites – ranging in price from $70 to over $150 dollars – and all marketed as Art Nouveau estate rings. While many Art Nouveau rings were mass produced, and it is likely that rings of the exact same style survived today, it does seem peculiar. There are two different sellers on e-bay alone that are selling this exact same ring under an Art Nouveau heading. Added to that, the stamp ‘Orlando’ does not seem to relate to an Art Nouveau period ring – if the Orlando is in reference to Orlando Florida. During the Art Nouveau period, Orlando was barely a town – while it became a popular resort town in the 1900s, during 1875 less than 100 residents lived there. It just doesn’t seem likely that an Art Nouveau ring would have been crafted in Orlando at that time – and certainly not mass produced. It is possible that ‘Orlando’ is a maker’s mark or manufacturer mark – but most maker’s marks and manufacturer marks are shorter and are usually initials or letters accompanied by a particular shape to distinguish them. So – with all that added up together, I would use extreme caution with this ring. Keep in mind that rings can be crafted to look worn – even patina on silver and gold can be faked (although an experienced jeweler/appraiser can tell the difference). Before purchasing the ring, ask the seller why it is believed that the ring is an Art Nouveau period piece. And if the seller cannot provide any additional info about the ring, and if the seller is lacking any identifying information biographical information (for example, the seller’s experience or knowledge as an antique dealer) and if the ring does not come with a refund policy – then it would probably be wise to pass on this one. Do write back if you have any additional questions – or if you find out any more info about the ring (I’m particularly intrigued about the ‘Orlando’ stamp!). 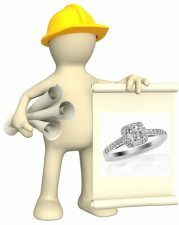 Comments for Dating a ring? Possible Art Nouveau Ring? I also have a ring from my grandmother that is stamped sterling and Orlando. It appears to be an engagement ring. Hi - well that is interesting. We will check into that a bit more and see if perhaps there is a designer by that name. Thanks for the info, and if you find out anything about the ring in the future do write again! I have this same ring in my possession (marked "Sterling-Orlando") and can date it to 1935 as I have a photo of both my mother and my aunt wearing it. Hi! I have an old brass ring with a amethyst glass stone and there is no question it is old and art nouveau and it is marked Orlando !